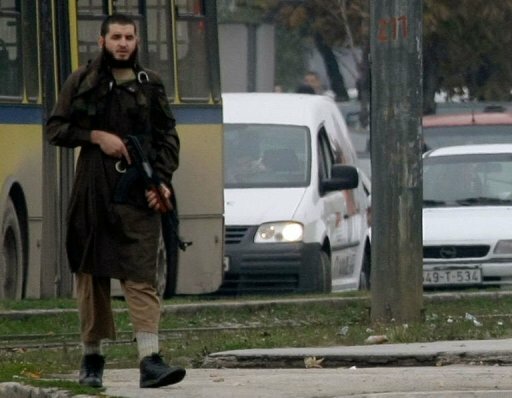 Serbian police on Saturday said they had arrested 17 people in the southwestern Muslim-dominated district of Sandzak, on suspicion of links to an Islamic extremist who opened fire on the US embassy in Sarajevo. "Police detained 17 persons suspected of being members of the radical Wahhabi movement and having close links with Mevlid Jasarevic," the Interior Ministry said in a statement. Wahhabism is a strict and ultra-conservative branch of Islam which is dominant in Saudi Arabia. The suspected radical Islamist Jasarevic, a Serbian national from Novi Pazar, was wounded and arrested after opening fire Friday on the US embassy in Sarajevo. A police guard was wounded in the attack.